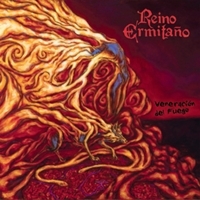 It must be about 4 years ago that I reviewed an album of this doom band from Peru. The style hasn't changed a lot since then, but I have to admit that I appreciate their music a little bit more than back then. Still the style of bands like Black Sabbath, Saint Vitus and Count Raven can be heard in their music. The guitar riffs are mixed rather up front in the music and like on the predecessor Tania Duarte is still responsible for the vocals. All the songs have Spanish lyrics and the style of singing hasn't changed a lot, it still gets boring after a while, not enough variety. For the musical variety you hear violin parts in "Cuando la Ruz te Encuentre" and flute and folk influences in "Sangre India". But these things are not enough for me not to get a little bored after a while. However, if you are a real doom fan, I think you will be drooling after listening to this over an hour worth of music.